Discussion in 'News & Patches' started by Starzeh, Nov 4, 2018. Mass griefing is not allowed. This goes for bases or the free world map in general. Mass grief will be dealt with on a case-to-case basis. If you are not willing to take a temporary ban or are not willing to clean up what you've created, don't do it. "Cubing" of bases is not allowed. You must use the protection blocks to protect your base, not just the outside walls. If this is found to be happening, the protection blocks will be destroyed and no refunds will be given. If it continues to happen, we'll take more drastic measures. You can now use /guild lookup [name] to view a player's guild status. More information will be added to this in the future. You can now use /. to toggle guild chat. Guild messages have been changed to be more visible. 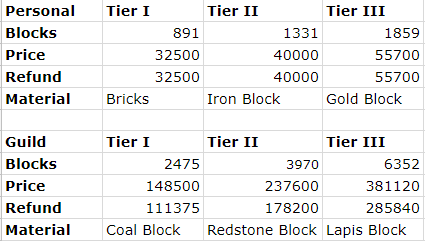 We have changed the price of the current guild protection block, as well as added two more tiers. You have 48 hours from the time of this post to receive a full refund from your current guild protection stone. Use the new guild protection stone to replace it. After the 48 hours, the original 300k stone will be destroyed. Br0, Stick, Linkay and 1 other person like this. How do we get the refund on our old pstones? Do we break them or ask you to refund us? Does tier3 personal give 10% refund or is that a typo? You break them. Refund price is currently set to 300k. Premium members still receive one extra of each type. Ban evading with an alt will result in both accounts being banned permanently. That goes for evading a temp ban as well. Can someone explain "cubing" to me? I assume it means placing pstones around an unprotected area to protect it. This post implies kunal plans to mass grief and ban evade, why isn't he already banned permanently? Sorry if this has been asked - if premium expires, what happens to the extra pstone? MGrams1332 and kunal1234 like this.